He told The Sun the PM’s plan would “probably kill the deal” as it would mean the US “would be dealing with the European Union” instead of with the UK. Downing Street has not yet reacted to Mr Trump’s remarks. Mr Trump also said that former foreign secretary Boris Johnson would make a “great prime minister”, adding “I think he’s got what it takes”. In his interview, he renewed his criticism of London Mayor Sadiq Khan over last year’s terror attacks in the capital, saying he had done “a terrible job”. 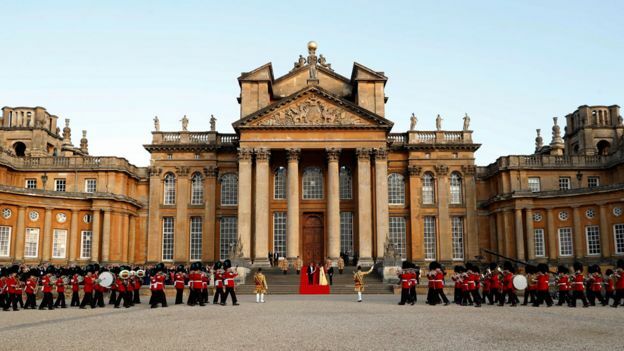 The president and his wife were given a red carpet reception at Blenheim Palace, Oxfordshire on Thursday evening. They were at a black-tie dinner with Mrs May as news broke of his interview with the newspaper, which said it was conducted while he was in Brussels. 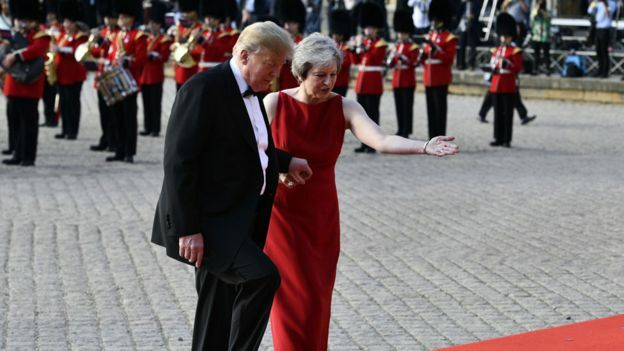 Mr Trump told The Sun newspaper that the UK’s blueprint for its post-Brexit relations with the EU was “a much different deal than the people voted on”. He said the Brexit proposals Mrs May and her cabinet thrashed out at Chequers last week mean it would be “most likely … we would be dealing with the European Union instead of dealing with the UK, so it will probably kill the deal”. “I told her how to do it. That will be up to her to say. But I told her how to do it. She wanted to go a different route,” he said. The US president also said he was “cracking down” on the EU because “they have not treated the United States fairly on trading”. The BBC’s Political Editor, Laura Kuenssberg, said Mr Trump’s interview had “driven a bulldozer” through Mrs May’s claim that the UK would be able to get decent trade deals with the wider world, while sticking to the EU rules. UK reaction to the president’s remarks has been mostly critical. 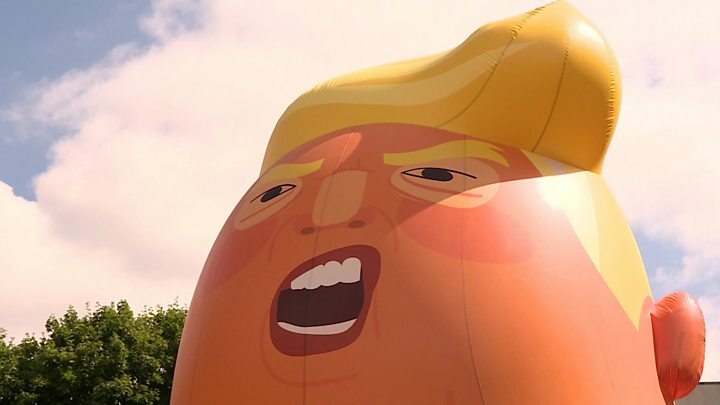 Labour MP Phil Wilson, supporter of the People’s Vote campaign which calls for a public vote on the final Brexit deal, said Mr Trump’s comments showed the prime minister’s “botched” Brexit proposal was “worsening hour by hour”. Mr Trump’s comments came on the same day the UK government published its proposal for its long-term relationship with the EU. The long-awaited plan is aimed at ensuring trade co-operation, with no hard border for Northern Ireland, and global trade deals for the UK. But leading Brexiteers, Boris Johnson and David Davis, resigned from the cabinet days after ministers reached agreement on the plan at Chequers a week ago. President Trump drives a bulldozer through the government’s central claims about their compromise – that the UK would be able to get decent trade deals with the wider world, while sticking to the EU rules. A lot of this visit has been carefully choreographed, as the prime minister and the president dance around each other. But if the president really wanted to help her build support for her controversial compromise, this isn’t the way to do it. 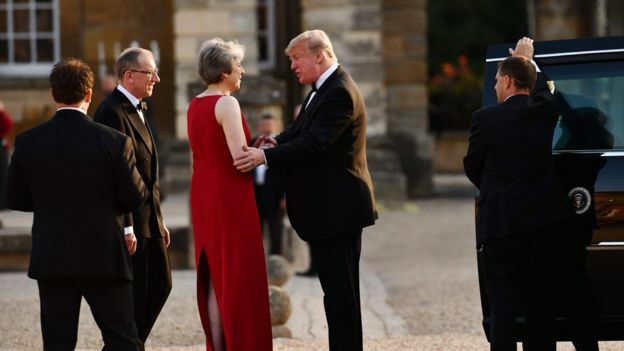 At Thursday’s dinner, Mrs May said that more than one million Americans work for UK-owned firms, telling Mr Trump: “As we prepare to leave the European Union, we have an unprecedented opportunity to do more. 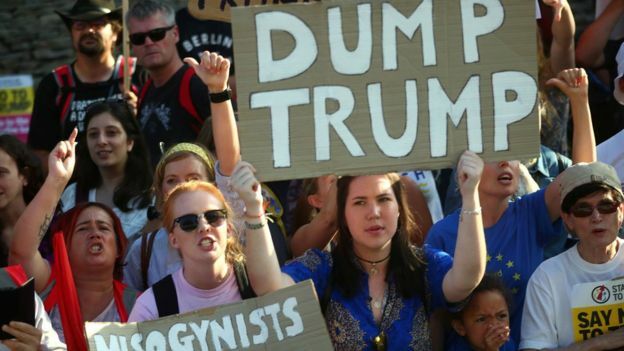 As Mr Trump arrived in the UK, protesters gathered outside the US ambassador’s residence in in Regent’s Park, London, and an estimated 1,000 of them demonstrated near the palace, the birthplace of wartime Prime Minister Winston Churchill. Extra security is in place to police the protests. 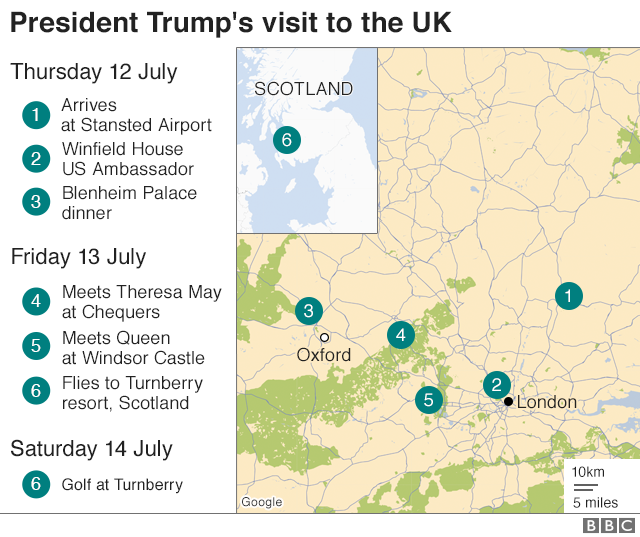 More are planned for the second day of Mr Trump’s visit.